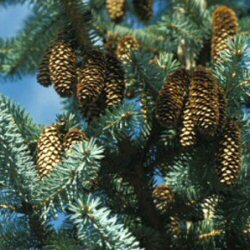 Buy Sitka Spruce Tree (Picea sitchensis) online from UK fir tree supplier of cell grown hedges and trees. A very fast-growing (1m of growth per year), large tree primarily of economic importance. Sitka spruce (Picea sitchensis) is the most important commercial forestry tree in Britain. To give you an idea of why it is important you need to understand "Yield Class". This is a measure of the average cubic metres of wood per hectare you can expect. Sitka Spruce can provide 14 cubic metres of wood per hectare per year whereas Oak is as low as 4. A native to North America, it thrives in a wide range of soil conditions, including extremely poor and exposed sites, hence its attraction. Expect a final height of around 50m but this is completely dependent on weather, local soil conditions, low flying helicopters, tree thieves and comet activity in your area. As an informal hedge, Sitka is well suited. By informal, we don't mean that it uses your first name at meetings, helps itself to the biscuits the first time it visits your house and chats your girlfriend up. An informal hedge means that some or all of the shape as Mother Nature intended has been preserved. So a very formal hedge would have straight lines measured by laser, think of Box hedging, whereas an informal hedge would be trees planted in a row and almost left to their own devices expect basic pruning. By pruning the leader out of the Sitka Spruce trees, the plant would put its energies into side branches which would be needed if you were using it as hedging. Plant at roughly 1 metre spacings. Deep, moist and well drained soils will give you optimum growing conditions with upland sites giving favourable results, this being the reason why North and West UK provide good growing conditions for Sitka Spruce. Sites with less than 1000mm of rainfall per year should be avoided unless the soil is naturally moist. Typically, Sitka spruce is mostly planted as a commercial foresty species, there is on reason why it should not be planted as an individual tree or as an avenue of trees. Estate and Policy Woodland plantings from the 18th Century often found this tree planted along with other North American conifer species. Today, 150 years later these trees form an amazing sight and we think that this tree worthy of planting to achieve the same effect for future generations. Dear sirs, it would appear the wood vine has a communication problem , i sent on the trees behalf a thank you and testimonial which appeared on your site, we the tree planting party can confirm this, Trev and 20 of his mates are planted but the other 10 refused , due to the heat and lack of moisture, they decided i had enough to do watering the twenty, ,water is heavy to carry to Trevs mates new home, so planting is suspended, rest assured they are safe and well in a makeshift nursery till the time is right for a repatreaction with Trev and his mates in the hinterland of sitka spruce. as for pics Trev assures me when his back is straight and he has had a good rain bath he would be only to happy to oblige. Trevs new custodian is considering a new species to live near Trev in the near future, depending on how Trevs ancient relatives yield to a different life style. thats the root and branch of it for now. B Clarke 0718 Editors note. When asking for a Sitka Spruce testimonial from our customers, we referred to them as Trev the tree.